Dr. Kristen Adams is currently doing the hygienics. It is great to see a dentist actually cleaning your teeth. The cleaning is thorough yet gentle. Thanks to cosmetic services such as Zoom! teeth whitening through our office in Sacramento, California, achieving dazzling, beautiful smiles are easier than ever! With a simple bleaching service in our state-of-the-art facility, patients can enjoy the benefits of a healthy vibrant smile! Zoom! teeth whitening is a bleaching method to lighten the color of natural tooth enamel quickly, easily, and affordably. Patients can lighten either the upper or lower dental arch—or both—depending on their needs. Custom bleach trays, similar to mouthguards, are fabricated for patients and are ready in just a day or two. Special bleaching agents are provided to the patient to place into the trays and they are worn for a few hours every day. The special bleaching agent will take the stains out of the teeth without negatively affecting the natural tooth structure or dental restorations. Once patients have achieved the desired whitening effects, they can continue to undergo occasional maintenance treatments to ensure they keep their brighter, more beautiful smile looking great! Before and after photos can be taken at the first and last dental appointment to show patients the results! Want to look years younger with whiter teeth? Your upcoming wedding or 25 year reunion is on the calendar and you want to look your best. Whether it’s for a social situation or a more professional appearance, whiter teeth are no longer just for the Hollywood set. Our teeth become darker with age due to our food and drink choices or you might have taken a medication that altered the color of your teeth, causing social embarrassment or suggesting to people that you don’t take care of yourself. In one visit we can professionally whiten and brighten your teeth. Enamel loss is irreplaceable, don’t be fooled by less effective methods that could take months to show any results and may damage your teeth. Call us now to schedule your teeth whitening appointment and step out tomorrow with a dazzling smile and that confidence that you deserve. 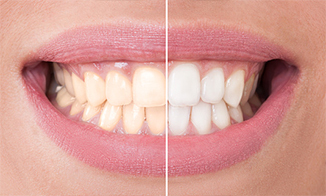 Patients can use dental bleaching to address staining and discoloration of the natural tooth enamel that can be caused by aging, foods, and chemicals. With Zoom! teeth whitening, patients can use the most advanced bleaching technology to achieve a beautiful, more brilliant smile in just a few short weeks. What are the benefits of Zoom! teeth whitening? Patients of all ages can use this particular bleaching method. It can restore brightness and address dull, discolored teeth, bringing life and excitement to a smile. It can correct mottled tooth staining, yellowing, and discoloration that can leave teeth looking drab. Why should I consider Zoom! teeth whitening? Zoom! teeth whitening stands apart from traditional, over-the-counter whitening products. Many of these are weak solutions, so they are unable to address serious staining and discoloration of the natural teeth. Zoom! teeth whitening is a professional-grade product that is proven to provide results. Additionally, over-the-counter products can cause damage to the teeth and gums if not used properly. Every smile is special, and we believe our patients deserve options in teeth whitening. With Opalescence, you get a brilliant strategy that works for your busy schedule, budget, and smile-brightening goals. Take-home whitening is a popular choice. We take impressions of your mouth to create personalized trays that fit comfortably. With a supply of prescription strength gel, you whiten at your convenience – for about an hour during the day, or overnight while you sleep. The formula is available in multiple flavors and concentrations, for a completely customized whitening experience. The Ready to Go kit is a good pick for travel, or for the patient who wants to get started fast. Trays are pre-filled with medical grade bleaching agent. They are ready to wear, right out of the pack, and disposable. For whitening without waiting, we offer Opalescence in-office treatment. No light-activation is needed for stunning results in about an hour. See the smile experts at Adams Dental Associates for whitening as unique as your smile. Sacramento area dentist deals with professional teeth whitening services such as Zoom!